It took quite a long time before I have finally decided to start blogging about my flying. During last year I found a lot of useful information in some blogs where authors describe their journeys to different countries. This was the main reason for the decision to try to add my 2 cents. In 2008 I was flying in Austria, Germany, Switzerland, France, Italy, Croatia, Montenegro, Albania, Macedonia and, of course, in my homeland, Slovenia. I'll try to describe these flights in subsequent weeks in the order as they occurred. 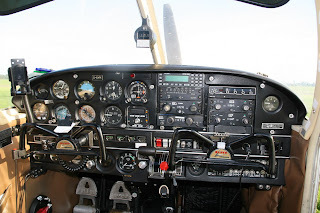 In 2007 I found in Germany an old Piper PA-28- 140B Cherokee, manufactured in 1969, which perfectly fits my requirements. The price was reasonable and affordable. During this year she got new windows, S-mode transponder, had a 1000 hour check, and I added numerous small, but very useful things. The aircraft has 2 COMs, 2 NAVs (one is ILS), built-in old GPS receiver coupled to autopilot. I am using also Garmin GPSMap 496 which is mounted on the yoke. The aircraft is registered for VFR flying and has a STC for MOGAS.